Dear readers, we wanted to inform you about a unique spiritual event that is currently taking place in the Spiritual Research Centre in Goa, India. His Holiness Rambhauswami Maharaj, a Saint from Maharashtra is visiting the Spiritual Research Centre and Ashram. He currently lives in Thanjavur, Tamil Nadu. Since 1997 he has only been eating two bananas per day and a small glass of milk. He has stopped all intake of water too since that year. Medically, that a person can survive on such a diet especially without water, is an impossibility. 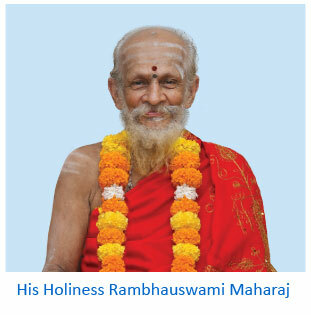 Yet the simple and austere Saint, His Holiness Rambhauswami Maharaj is in very good health and very active for a 78- year-old. 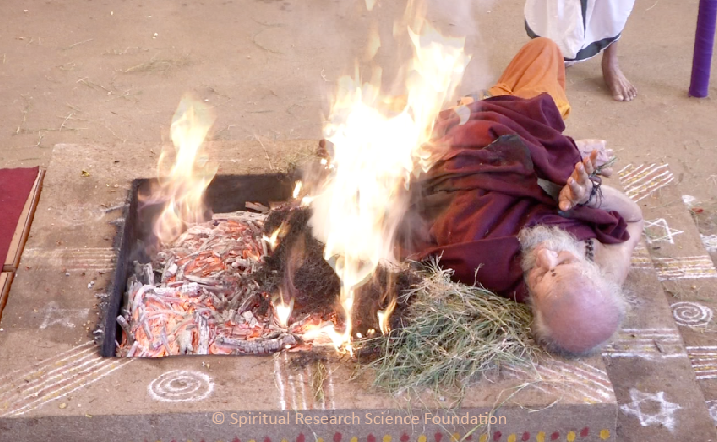 His specialty in the field of Spirituality is that He conducts sacrificial fires to spiritually purify the environment, to protect seekers and for the establishment of the Divine Kingdom on Earth. However, the amazing thing is that He actually enters the sacrificial fire Himself, but does not get burnt. Over a three-day period, He will be entering the fire a number of times (collectively adding up to approximately over 3 hours in the fire). Very often we saw him putting his hand covered in ghee (clarified butter from an Indian cow) into the flames to place wood or fruit. We are also marvelling at His stamina as along with entering the sacrificial fire, He is conducting rituals the whole day. Moreover, He does all of this while fasting completely and maintaining complete silence. 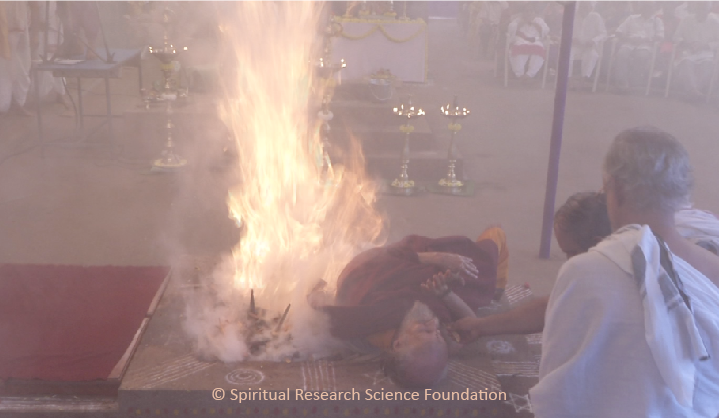 Here are a few pictures from the sacrificial fire that is currently taking place at the Spiritual Research Centre and Ashram. 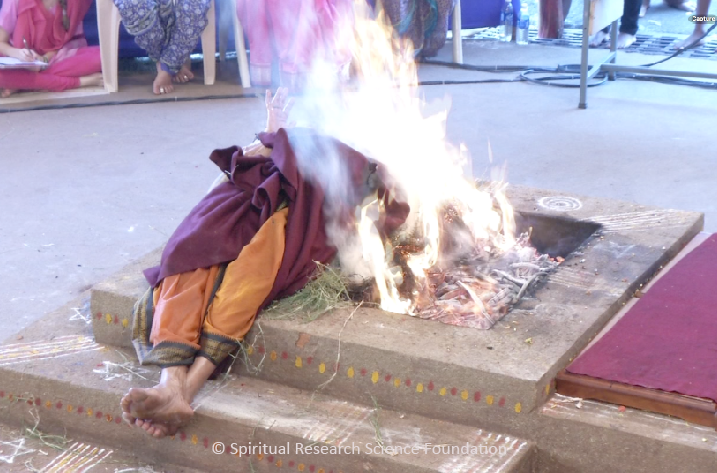 Another interesting spiritual phenomenon, which we observed was that even before the sacrificial fire was lit, seekers attending the ceremony saw vapours and fumes coming out of the sacrificial fire pit. This unfortunately could not be caught on camera as they were too subtle. We will be conducting spiritual research as to how such a feat is possible without any bodily harm to Him. We are very grateful and fortunate to witness such a phenomenon and a great Saint such as His Holiness Rambhauswami Maharaj. Dear Indhra, It is nice that you wish to meet Swamiji. This video is from Swamiji’s visit to SSRF Research centre. We will not be able to assist you in meeting Swamiji as it be beyond the scope of SSRF. We are not clear about your request, in SSRF seekers are guided about daily spiritual practice. Sir our family is very much disturbd due to black magic,all sources of money is stopped,my brother became mentally ill,he is not married his age is 38 now.my sister was possessed when she was completing her graduation.but due to Lord Duttas kripa she got well.but my father died by cancer. Don’t know what has been mistaken by us.who is behind the screen making all this? Please see if you and other members of your family can apply these spiritual solutions. ram bhau swami jimaharaj the age 13 me an d my family faceing alot of promblems fom the relative.my n earest relative black magic me and my family due to this reason education money marriage every thing lost due togod grace me and mybrother and myliveing .at the age of 28 severe blac k magic on me next 20 yrs iam sidda brahmai. two times i got fractured . iam not able to do day today work. and ialso written letter to you swamiji . since the address is letter came back.kindly help me torecover from this dipperssion . Dear Ramakrishna, we can understand your situation. Apparently, you have written asking help from H.H. Rambhauswami Maharaj which we cannot forward further. 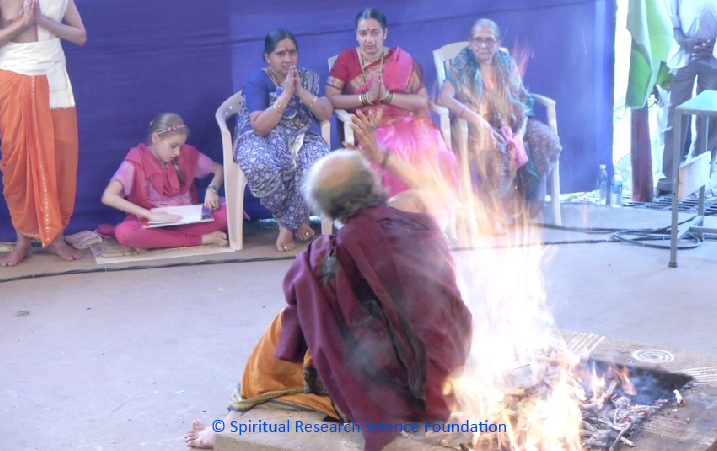 SSRF is helping seekers in starting spiritual practice and overcome spiritual obstacles. You can consider starting spiritual practice. We would suggest to you to implement two chants shared in the article ‘Start your spiritual journey’. In that article, it is explained how much we can do both chants and in what way. We suggest that you do a Universal chant of Om Namo Bhagavate Vasudevaya as this chant is most conducive for seekers until the year 2023. This chant also helps with all types of negative energies as protection and fighting force. We also suggest to focus presently more on the chant regarding departed ancestors and to do it as per your capacity, with the intention to increase slowly within a month or two to 2-4 hours of daily chanting. Since chanting is done in the mind, it can be done any time and everywhere, so it is manageable. Please let us know within a few days after starting the above how you are and we will assist further. The root cause of depression can often be spiritual in nature. We would recommend your son to try doing regular spiritual practice along with self healing remedies. Please write to us via login facility and we will gladly assist you further. respected sir / mam , i m very happy to see such spritual page & regular conducting workshops by which u r spearding postive energy to people . i want to know about ur next workshop in india so that i can also attend that . & i have also some personal expreince which must be helpful for those who don’t believe in God & want to see God . Welcome to SSRF. We are very glad to see your interest in our spiritual workshops. Please see all the details and a link for registration at this link. Please can we contact him for healing? Doctors have no treatment for some problems. Only God’s grace channeling through great Gurus have unlimited healing powers. SSRF recommends regular spiritual practice and self healing remedies as the only permanent solution to overcome any influence of negative energies as well as to progress spiritually. If you have any questions on spiritual practice and spiritual healing remedies please write to us via our login facility and our seekers will gladly respond. It is truly amazing. Blessed are those who are fortunate to witness live this spiritual guru. Thanks so much for sharing this information. I am always interested in learning about new cultures and religions. I am also amazed by the images included! This seems like a very spiritual experience. Why don’t these kinds of incidents become world famous ? Modern scientists would be stunned by this and this saint can make 99 % of the world population progress in spirituality. I have found out ways to purify my home from negative energies from the knowledge that I have gained from this website. 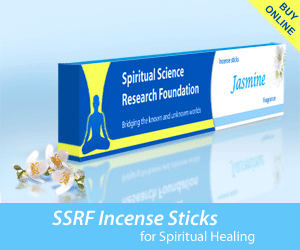 SSRF has been very useful for my spiritual journey. I am taking my chanting more serious and have been chanting Sri Gurudev Datta and Lord Jesus for 1 hour and 30-45 minutes everyday. I have made a plan to spiritually purify my residence everyday. 1. Use holy water derived from holy ash and fill holy water inside spray bottle to spray premises every three days. 3. Vigorously keep dirt out from the house to reduce the raja-tama predominant frequencies originating from the dirt out. 5. Do spiritual practice every day as this adds to the positivity in the environment. It is very nice to see your efforts, just continue. Maybe you can also now see to go for the next steps of spiritual practice. For direction about that please write to us through our login facility as seekers can share in more details about it. It looks like he attained Bhuta Siddhi. There are few yogis who can walk on water and fly. What is the use of wasting ur life for attaining siddhi to fly in air or float on water which can be achieved by simple aeroplne or a boat. What is imp is to overcome shadvikaras and attain ur ur true divine nature which is the hardest task almost impossible . Only when one attains his true nature all problems disaapear! Walking on fire or levitating are very very trivial in comparison to gaining power over our vikaras! I am not at all commenting on this fire yogi bcz I have no authority in doing so. I am talking in general. Pay more attention to purifying ur thoughts and heart which will lead u to attainment of grace. Yes, it is true that main goal of spiritual practice is not to gain siddhis but to progress spiritually. However, H.H. Rambhauswami Maharaj, He is on the spiritual Path of Agni Yoga and He is worshiping Agni Dev, thus He gained these siddhis automatically. He is not doing this to show His siddhis, but this is His communication with Agni Dev. He is holding Agni Dev in His arms like a baby. H.H. Rambhauswami Maharaj has such spiritual emotion for Agni Dev, therefore, Agni Dev will not harm Him. I watched the film “The Fire Yogi”, which is a documentary on HH Rambhau Swami Maharaj. It is truly amazing how the mere watching and listening to the film awakens my bhav towards Param Pujya Rambhau and Ganesha. It truly makes me feel blissful and loose body awareness, going into meditative state where I feel communion with the loving and silent, observer and non materialized presence the Lord which is the doer of everything through mere resolve. However, I would like to ask: I thought HH Rambhau is a Saint from the Ganapatya sampradaya (sect) within hinduism as He worships Lord Ganesh in the form of Ucchishta Ganapati while performing yajna. Then I saw Him in another website showing puja (worship) to the 5 panchayatana Deities as per Smarta tradition (Lord Ganesh, Surya, Devi, Lord Mahesh and Vishnu). I am a little bit confused about this as now I am reading He worships Agnidev. Agnidevata is always offered ahuti during homa, yajna and havans, but I thought the main Deity is Ucchishta Ganesha. Please clarify this, I am very interested in developing complete surrender to God in a particular Divine Form and in this way also attain mantra siddhi to help people as I understand it’s only God’s grace and Divine Energy and not my personal effort nor ego which brings about and manifest miracles. We cannot say which sampradaya / sect His Holiness Rambhauswami Maharaj belongs too. Please understand that Saints are beyond sectarian forms of worship. To develop complete surrender to God (as you have expressed interest in being in such a spiritual state) one has to practice Spirituality regularly as per the 6 basic principles of Spirituality. We also suggest practicing the Personality Defect Removal as mentioned on the SSRF website. Why are symobols like the petagram on the föoor? Different symbols represent different positive energies, so they are drawn on the floor to attract energy and make atmosphere even more spiritually conducive. The name pentagram is given in recent history and it is connected with something negative. Actually this sign is used from ancient times and has many different positive spiritual meanings. This is truly amazing, it must be a very uplifting experience to witness this miracle happen.